Significant opportunities lie ahead for mid-sized ESPs, that’s for certain. First, in a continuation of the acquisitions of recent years, three big email service providers were absorbed into even bigger companies like ExactTarget by Salesforce, Responsys by Oracle, and Silverpop by IBM, and now smaller ESPs as well, most recently Bronto being purchased by NetSuite. This opens the door for mid-sized email service providers to become the providers for big brands. These companies can provide the capabilities needed for enterprise email marketing, and perhaps do a better job at it as they’re small enough to be able to customize their technology to meet client needs—as opposed to the technological rigidity of the bigger players who are unable to be that flexible. And who will emerge as our next “big three” in the email space? 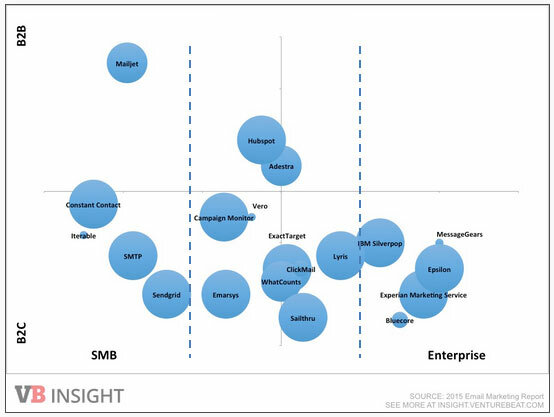 Among these mid-sized ESPs, I predict Maropost, Adestra and dotMailer will emerge as our next crop of top-tier email service providers, as they move to fill in the gaps left by the bigger three (although others at ClickMail have other predictions!). Keeping an eye on ESPs, we see new features popping up all over. Only check out the Feature Watch section here at EmailVendorSelection.com and you’ll see vendors are regularly adding and enhancing the features they offer. ESPs also seem to be making an effort to make things easier to do, even as they add features to their platforms. For example, we see email service providers improving their interfaces, with better drag-and-drop design that’s easier to use, and removing barriers that make tasks like setting up automation easier to do. We also see a certain irony in one current trend: the growing popularity of SMTP over a traditional ESP as a choice for businesses. Companies like SendGrid and Mailgun are growing because of the millions of transactional emails that are now sent by businesses like Uber and Spotify. However, one thing ESPs are doing is specializing, as they stop trying to be everything to everybody and seek out a niche. For example, Listrak has focused on retail, and dotMailer on Magento ecommerce integration. They are setting themselves apart with vertical niche expertise as a way to compete in a crowded and commoditized marketplace. That specialization also enables out-of-the-box integrations because it makes economic sense for such an email service provider to put time and money into a specific kind of integration that will work for potentially all of the clients in their niche. For example, Listrak has a built-in product recommendation engine. Any marketer who has been through a custom integration can appreciate the appeal of one that is plug-and-play. Outside of these specializations and built-in integrations, it is not necessarily the email service providers that are bringing about the big enhancements in email. Rather, in many cases, it’s the third-party vendors that are building solutions that make ESPs more powerful. Marketers today can buy advanced features that essentially plug in to an ESP, as opposed to asking the ESP to build a customization or tackling it themselves in-house. Now resources like apps marketplaces like the SalesForce HubExchange present marketers with an array of additional features that they can buy outside of the ESP and use inside of the ESP. For us at ClickMail, one of the most important of these enhancements lies in business intelligence. Marketers need more than the flat email reporting typical of email service providers, and it’s the third-party vendors that are going to make this kind of email analytics happen, as we’ve already seen with the visual analytics of eMVision. Finally, ESPs continue their march toward omni-channel marketing. It’s the buzzword and the name of the game moving forward. It’s email, social, SMS, web, ads, direct mail, Facebook, Twitter, Pinterest and more. It’s how marketing is getting done, in a way that lets marketers deliver messages how, when and where consumers want to receive those messages. And email is at the heart of it as the enabler of it. For example, a marketer can run an acquisition campaign that starts with email. Then when the recipient logs into Facebook the next time, they will see an ad with similar content in it, reinforcing the message of the email campaign. Does that sound a little invasive? Yes, but it will get better. We like to call omni-channel marketing “unsiloed actions everywhere.” All that data in all those different data repositories will now be able to be used across channels. Maybe the traditional ESPs will simply evolve into something else altogether, and start calling themselves Marketing Platforms instead, acting as the gateways to these omni-channel worlds. Bigger, better, bolder, more specialized and more powerful and across more channels…it’s definitely a dynamic time in the world of email with all of these changes coming about.